10 amp fuse for 911, C2, C4, Turbo, 928, 944, 968 and Cayman models. Blue ATC, 15 amp fuse for 911, 928, 944, 968, C2/C4, 993, 996, 997, Boxster and Cayman models (1985-2008). 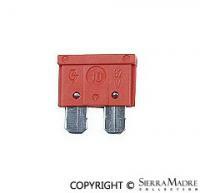 Red fuse (16 Amp) for all 356, 911, 912, 914, 930 and 912E models (1950-1989). Yellow, 20 amp ATC fuse for 911, 928, 944, 968, C2/C4 and 993 (1985-2008). 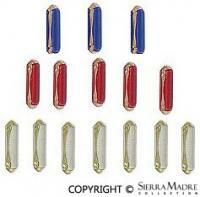 Blue fuse (25 Amp) for all 356, 911, 912, 914, 930 and 912E models (1950-1989). 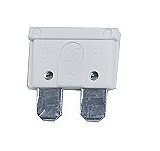 Clear ATC, 25 amp fuse for 911, 928, 944, 968, C2/C4, 993, 996, Boxster and Cayman models (1985-2008). 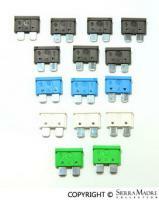 Green ATC, 30 amp fuse for 911, 928, 944, 968, C2/C4, 993, 996, Boxster and Cayman models (1985-2008). Tan ATC, 5 amp fuse for 911, 928, 944, 968, C2/C4, 993, 996, Boxster and Cayman models (1985-2008). 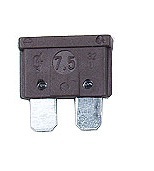 Brown ATC, 7.5 amp fuse for 911, 928, 944, 968, C2/C4, 993, 996, Boxster and Cayman models (1985-2008). Ceramic white fuse (8 amp) for all 356 models (1950-1965). Fuse Kit includes: (7) 7.5 Amp, (3) 15 Amp, (3) 25 Amp & (2) 30 Amp. They fit: C2 (90-94), C4 (89-94), 911 (94-09), 928 (85-95), 944(85Late-89), 968(92-95), Boxster (97+), Cayman (06+). 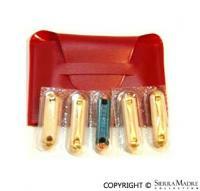 Five fuse kit and pouch for 356, 356A, 356B, 356C and Speedster models. Worn out wire harness and don't have thousands of dollars to spend? This universal wire harness kit could do the job! It comes with fuse box, fuses, connectors , electric tape and instructions.